Robert Bruck, Karl Mediz, Dresden, 1904, p. 44. Oswald Oberhuber, Wilfried Seipel, Sophie Geretsegger, Emilie Mediz-Pelikan und Karl Mediz, Katalog zu den Ausstellungen, Österreichisches Museum für angewandte Kunst, Vienna and Oberösterreichisches Landesmuseum , Linz, 1986, p. 264, no. 32. Karl Mediz was one of the most fascinating and intense artists who flourished in Austria and Germany in the late nineteenth and early twentieth century (fig. 1). Already in 1903 the influential art critic Ludwig Hevesi had identified him as one of the leaders of what he described as “des deutschen Neu-Idealism(New German Idealism).” Born into a merchant family in Vienna, Mediz grew up living with an aunt in Znojmo, a town in southwestern Moravia, and worked for his uncle in the sister city of Retz in Lower Austria. His artistic talent was recognized by the leading Viennese court painter, Friedrich von Amerling, and so he entered the Vienna Academy of Fine Arts in 1884, studying with Christian Griepenkerl and Fritz L’Allemand. He then continued his education with Paul Hermann Wagner and Alexander D. Goltz in Munich. This was followed by a period of study at the Académie Julian in Paris where his masters were Bouguereau and Robert-Fleury. Then in 1888 he spent time at the artist’s colony at Dachau, Bavaria, near Munich with such artists as Adolf Hölzel and Fritz von Uhde, but most importantly there he met fellow artist and his future wife, Emilie Pelikan (b. 1861). They travelled together to Paris and Holland, visiting the artist’s colony in Knokke. They married in 1891 but despite positive support from art critics could not earn a decent living in Vienna. After study trips to Hungary and Italy, they settled in Dresden in 1893. That year both of them were represented in the first exhibition of the Munich Secession. They likewise both exhibited at the first Secession Salon in Vienna in 1898. Between 1902 and 1912 Mediz was a member of the progressive Hagenbund group of Vienna, and he and his wife were given a joint exhibition by this organization in 1903. She died suddenly of heart failure in 1908, aged only forty-seven. After this Mediz became reclusive and created primarily graphic works and just a few portraits, morbid allegories, and flower subjects. He died in Dresden shortly before or during the Allied bombing of the city. Fortunately his works survived and the estates of both artists were controlled by their daughter, who forbad any exhibitions of their works, and only after her death were they transferred in 1975 to the Gerhart-Hauptman Museum in Radebeul, Austria. Then the estate was purchased and distributed by the Viennese art dealer Kurt Kalb in 1985. The following year the almost forgotten artists were made better known by a major posthumous exhibition in Vienna and Linz. These two artists are man and wife; they have wandered in many places together, over the highest mountains and across glaciers, on the banks of deep rivers and on their pilgrimages have painted scenery and portraits and everything else between. They have endured the greatest hardships together and have worked together; they have chosen the same subjects for their canvases, yet their individualities remain…Of the two, Karl Mediz is more monumental; he works with a great and massive concentration, and yet with a poetry of expression, a real German energy…They are both so fond of rich coloring that they seek those parts of the earth where Nature is most profuse in her gifts. They have both endured the blaze of the sun on the highest points of the Dolomites, often spending days on their heights and sleeping under the blue canopy of heaven. In their open-air existence they have learned the true shades of the rays of the sun as they fall upon earth; and so they know full well all the tones from orange to violet, and from violet to orange. This painting dates to the period when Mediz and his wife were travelling in Italy along the Adriatic coast in the year of their marriage 1891. They spent time then and later at the seaside resort town of Duino, known for its picturesque castle set high on the cliffs of the Gulf of Trieste, which was also to inspire a series of elegies by the German poet Rainer Maria Rilke. The rocky coast captivated Mediz, who seems to have had a fascination with the stones, even in 1898 devoting one of his monumental figurative compositions (fig. 2) to The Stone Carriers of Ragusa (171 by 261 cm., now in the Belvedere, Vienna presented to the museum in 1984 by the same Viennese dealer, Kurt Kalb, who owned the present work). The brilliance of Mediz’s depiction of the natural setting of sun-drenched rocks by the sea is evident here and in a number of other scenes he painted of the rocky coast (figs. 3a-g), but what makes this one singular is the presence of the greenish-blue creature on the rocks. On the verso, in what is most likely the artist’s hand, is an inscription identifying it as a “Lindwurm,” and the translation of “lindwurm” is “wingless dragon” – in other words a mythological beast. It is even the term used in depictions of Wagner’s Ring Cycle(figs. 4a-d) to identify the dragon into which the giant Fafner transformed himself before being slain by Siegfried. Wagner’s Siegfried was first performed at Bayreuth in 1876 and then premiered in Vienna in 1878 with set designs by Joseph Hoffmann, so Mediz could definitely have seen it or images that were published of it. Mediz’s version of the very long, snake-like dragon (fig. 5) has a beady eye and grim expression and seems to slither along the surface of the rocks on webbed feet. A series of pointed protrusions run along the length of its body. Painted in an almost pointillist manner with dots of blue, green, and red paint, this dragon has a shimmering quality, as if it is a frightening mirage appearing in this unlikely setting. To title this painting “Der Leguan (The Iguana)” as was done in the 1986 catalogue of the artist’s works is totally wrong, since those lizards do not live in this region. 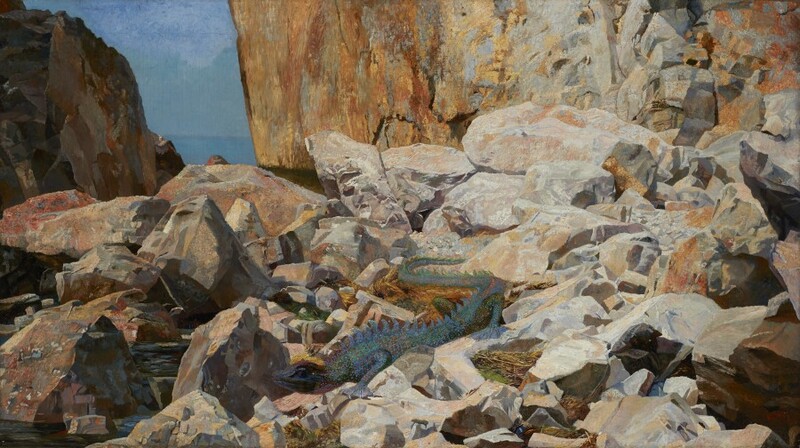 It might conceivably have been inspired by a variety of local Italian green lizard, but Mediz’s inscription, and the fact that an even earlier catalogue of his works listed “Der Drache (The Dragon)” in 1891 convincingly confirm that this is an early example of the painter’s taste for imaginary themes. Mediz, in fact, painted in the same year a view of the rocky coast inhabited by aNixeor Mermaid (fig. 6a), another of the fantastic beings that also appeared in Wagner’s Ring. Later in 1902 he produced a bizarre winged “Sirene” kneeling on a rock (fig. 6b). In the same mode his wife in 1895 drew two pastels of mythological beings -- a female Centaur and a Sphinx (figs. 7a-b). Thus both artists clearly delighted in creating fanciful compositions, combining in this way reality with fantasy.